It is quite the place. The term “concrete jungle” is made self evident here. The claustrophobia of the city streets is overwhelming at times. Narrow streets and sidewalks, very tall buildings, being a minority and alone, and signs in Chinese everywhere lend to this feeling. Sometimes is feels like the whole block is going to collapse in on itself. The winding streets and foreign language make it very hard to navigate if you don’t know where you are. Basically wherever you are, all of the buildings around you are at least 25 stories tall. This means that at ground level the buildings are so tall that they block any view of a very tall skyscraper, the 88 story IFC Building for example, that you could use as a landmark. I use this trick in Chicago with the Sears (Willis) Tower and other buildings. It helps me know where I am and what direction I am traveling. The fact that I haven’t the slightest clue what any of the signs say nor what the people are saying makes it much much worse. Street signs are almost nonexistent on smaller roads and even if they are there, the sign is small and gray; just so it can blend perfectly into the surroundings! When you walk down Nathan Road, the main shopping road in Kowloon, the jungle creatures come out. I was harassed by every Indian man with a suit on about tailoring. Then shopkeeps along the road of the smaller stores come and yell at you to buy their wares. This is the China I remember from Beijing. However, these types of people were usually confined to the markets. Traveling to such a foreign place seems like it would always be better with a friend or family member. I think that if I had a partner in crime, so to speak, the whole experience would have been very different. We would at least have two heads instead of one to solve a problem (or to beat off attackers). Just having someone to talk to during a meal or seeing a sight makes it more enjoyable. Being Steven Glansberg gets really old really fast. Even if the person was someone I didn’t particularly like, I would have someone to share the experience with for the rest of our lives. As a solo traveler, I cannot relate the experiences that I have lived with anyone in the same way. The sense of camaraderie and a shared laugh of nostalgia is a wonderful thing. Hopefully this is just a mix of jet lag and culture shock. I hope so. This is only the beginning of my Southeast Asian excursion. 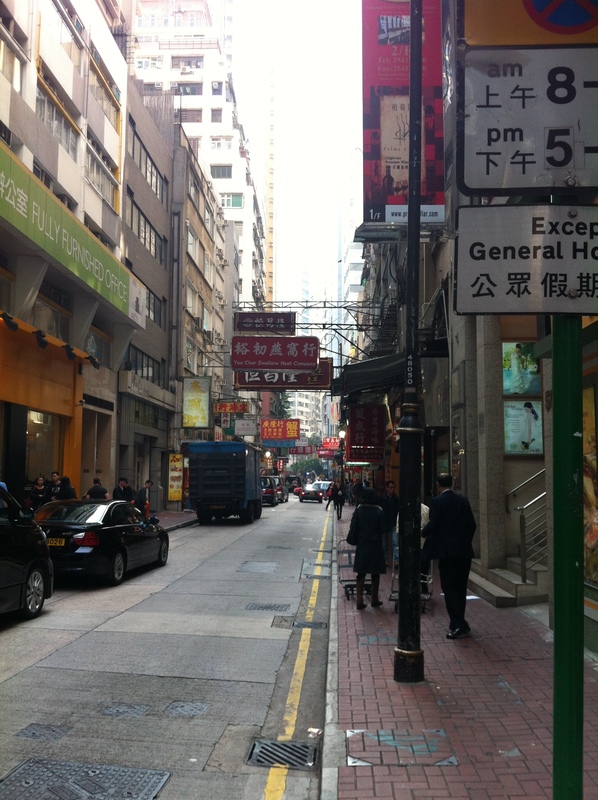 This entry was posted in Hong Kong, Travel, Uncategorized and tagged Hong Kong, Travel on February 25, 2013 by hanlont. I hope you begin to find your feet, and more and more magic while travelling in Asia. It is an amazing place.